There are few things as relaxing and indicative of summer than enjoying the warm weather with a cold brew and some good jams! And it is that time again in and around Compass Pointe. So, pull up a lawn chair and prepare yourself for a summer full of friends, family and fun live music! Starting May 25th, Wilmington’s fantastic summer concert series will kick off its 13th season! The Downtown Sundown Concert Series will be held every Friday evening starting at 6:30pm. Admission is free and located at Riverfront Park. This year’s lineup includes many tribute bands and all headlining acts are opened by local bands. For a complete list of bands participating this year, click here. Beer and wine will be available with the purchase of a $1 wristband. There are many local restaurants within walking distance of the concerts to complete your evening! 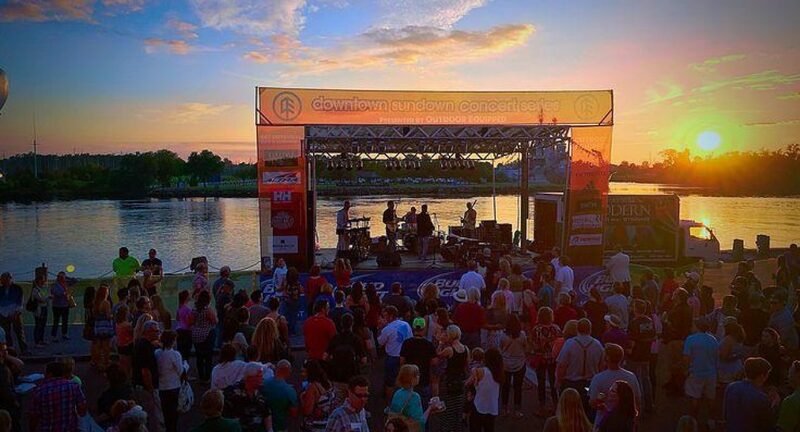 If downtown Wilmington isn’t your scene, there are other beautiful locations to enjoy live music close by. The breathtaking Airlie Gardens also offers a summer concert series for your enjoyment starting May 19th. On the first and third Friday of each month this summer, Airlie Gardens will be alive with the sounds of the season. Tickets are $9 for adults and $2 for children 4 and older. Front Street Brewery and Noni Bacca Winery will be on site so bring your appetite as well! For a full list of performers or to purchase tickets, click here. Greenfield Lake Amphitheater provides yet another gorgeous atmosphere for tunes! Enjoy the beautiful cypress trees, wildlife and water views while listening to some great music at an incredible venue. Concerts vary all summer long but you can check out the schedule here. Children 5 and under are free and concessions are available. Since the beach is the place to be when the weather is hot-hot-hot, it stands to reason you should enjoy some live music there, too! Both Wrightsville and Kure Beach are hosting concert series this year. The Sounds of Summer Concerts in the Park will be held at Wrightsville Beach Park on Thursdays starting at 6:30pm and are free to attend! The first concert is June 14th. Carolina and Kure Beach have enough concert options to keep you busy all summer long. The Boogie in the Park Concert Series will be held at Ocean Front Park every other Sunday all through the summer and even into the Fall! The Fort Fisher Military Recreational Area will also have free live music on Fridays from 6:30-8:30pm all throughout the summer! And if you like music with an exciting finale, The Carolina Beach Boardwalk Blast will not disappoint! Every Thursday this summer you can enjoy live concerts followed by fireworks to round out the night! Beach concert schedules are available here! In addition, keep your eyes peeled for concerts happening right inside the gates of Compass Pointe this summer! The lawn at Latitudes will be hopping with great bands, friends and plenty of dancing! Our Facebook page is a great way to stay connected on events. At Compass Pointe, we’re ALL ABOUT great music, trying something new and having fun! If you have any questions about life at Compass Pointe or our wonderful southeastern NC area, we’re here to help! Visit our Contact Us form or call 888.717.6468 today!